Beautiful baby white christening booties, perfect for their special day. These unique off-white booties have a ribbed ankle and a satin panel across the front. A beautiful silver bible charm is hand decorated onto the front of each bootie. 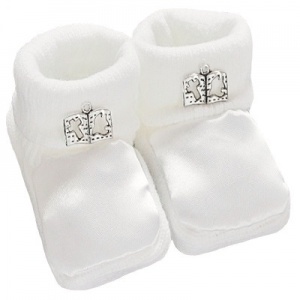 Soft and warm to ensure the best comfort for your baby's feet. Completely brand new and made just for you. Unisex so suitable for a baby boy or girl.